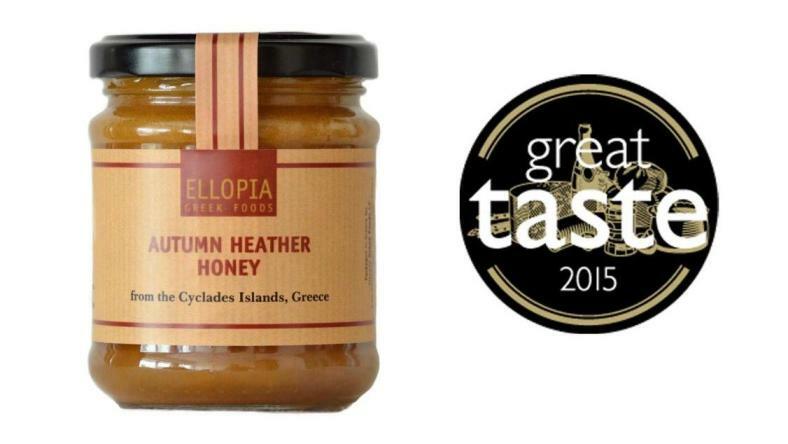 Our Autumn Heather Honey distinguished itself at the international Great Taste Awards 2015, winning a Gold Star ! Pure heather honey is produced from a select few apiarists on the Cyclades islands. In autumn, with the first rainfalls, the indigenous heather (erica manipuliflora) that covers the upper hills of the islands like a blanket, blossoms and gives us the last honey of the year: a very dense, intensely aromatic honey with a caramel-like texture, a unique, rich taste and great nutritional value. Aside from its distinctive taste and aroma, heather honey is traditionally valued for its medicinal properties (prized as an antirheumatic, diuretic, disinfectant and as protection against prostate and kidney diseases, as well as being rich in trace minerals), that are backed up by more recent scientific research. Spreading it on toast for breakfast is an ideal way to start your day. It is also used in cooking, especially in sweet pies and Christmas cookies, as a secret ingredient that adds both sweetness and flavour.